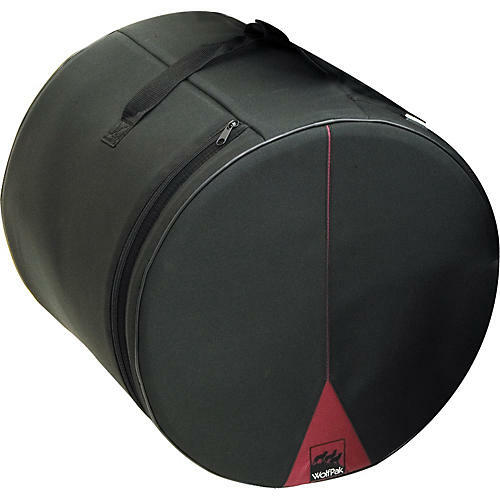 WolfPak Floor Tom Drum Bag 16 x 16 in. With modern class and style, the Wolfpak Floor Tom Bags protect a drummer's investment. The cases are made of a puncture-resistant polyester outer shell, with high-density foam padding, and a plush interior lining. On top of their premium design, Wolfpak offers a lifetime warranty. Some unique features to this floor tom drum case include Glow-In-The-Dark size indicators, longer strap handles for convenient carrying, and a specially designed Interior Mesh Pocket that holds extra drum heads.